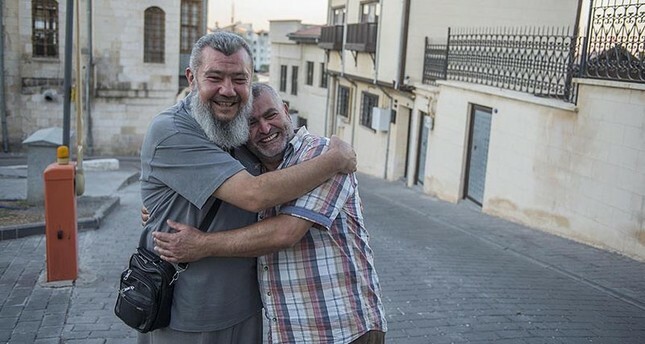 A Turkish man who lost his relatives, close friends and his house in the 1999 Marmara earthquake has met with the aid worker who saved his life by delivering medicine, money and food to the victim's house 18 years after the deadly disaster. 55-year-old Sabri Saral from Gölcük district of northwestern Kocaeli province —the epicenter of the 7.4 earthquake that ravaged Turkey's northeastern province— traveled more than 1,000 kilometers to reach Gaziantep in the southeast, hoping to meet the person who came to help and brought medicine for his family after the disaster. By the time Saral arrived in Gaziantep he only knew his rescuer's name —Murat, — his profession and that his father owns a supermarket in the city of 2 million people. "Everyone who heard that I was going to Gaziantep said 'Are you crazy, you would never find him,' but I said if the man wants to find, he will find and Allah would help, and took to the roads. I gave myself three days to find him, but Allah helped me, I found my brother Murat four hours after I arrived in Gaziantep," Saral said. Pharmacist Murat Temeloğlu was 20-years-old when the earthquake hit Kocaeli in 1999. As soon as he learned about the catastrophe and pharmacists were looking for a volunteer to transfer medicine to Kocaeli, the young man hit the road to reach the disaster site along with the medicine, aiming to help those who were affected by the earthquake. "He came to my house and asked if I was alright. He gave me some medicine. Then he left, but he stayed in my mind forever. How can you ever forget what happens in the hardest days of life," Saral said. After his arrival in Gaziantep, Saral went to the city center and found a mosque to pray, then entered the first street he came across to ask local shopkeepers whether they know Murat or his father. "I saw an old man and asked whether he knows pharmacist Murat, whose father owns a supermarket. The old man thought for a while, asked me to wait and called someone to ask for Murat to come over here," Saral said. The two men were very moved by their miraculous encounter, as they both recalled the disaster. Temeloğlu said that when he first saw Saral, he thought that the encounter could not be real as they did not share any contact details with each other. "We only saw each other for about an hour [in Kocaeli] and talked for a bit and I returned to Gaziantep, because I met him just before I finished my work. Now after 18 years my friend had come all the way down here and found me by asking. It is indeed a small world," Temeloğlu said. The 1999 quake of magnitude 7.4 in Turkey's most industrialized and densely populated region killed 17,480 people and injured thousands of others. Over 285,000 buildings were damaged and 600,000 people were left homeless by the 45-second quake, which left social and economic wounds that took years to heal.